Wine cellar waste water tends to be low in pH, low in nutrients and has a variable and often high organic load. The conductivity of the waste water is a function of chemicals used in the cellar and this too is variable. 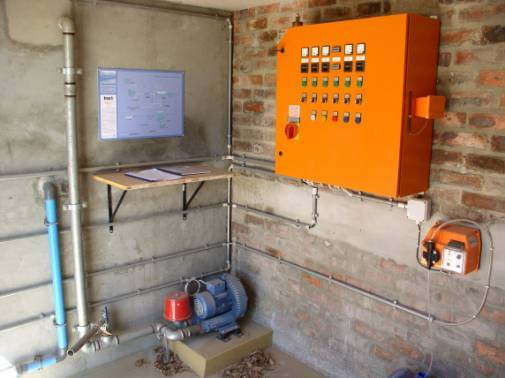 The South African National Water Act of 1999 (Currently under review) currently makes a distinction between discharge to a water resource and disposal via kikuyu irrigation. Waste water is discharged by gravity to the treatment plant. The treatment plant comprises a solids separation tank, bioreactor, lime dosing arrangement and the necessary process equipment. Sewage is connected to the solids separation tank, whilst cellar effluent is connected directly to the bioreactor. Settled sewage overflows from the solids separation tank into the bioreactor. Because cellar waste water is low in pH and nutrients a dosing arrangement is required. We make use of a robust and reliable system whereby clean water is trickle fed to a lime and nutrient solution holding tank. The overflow solution is then fed via gravity to the bioreactor. A geared motor and paddle arrangement ensures that the lime and nutrients stay in solution. The function of the bioreactor is to mimic a riverine environment. At the base of the bioreactor is an aeration manifold. One of the primary functions of the bioreactor is to meet the high oxygen demand. The bioreactor is also sized to ensure that the biomass has enough time to make use of the available oxygen whilst feeding on the organic material in the waste water. Biological treatment of the waste water is cyclic and PLC controlled. The operational regime is known as the Fill and Drain method. (This method is similar to Sequencing Batch Reactor operational systems). At the start of the Fill and Drain cycle, waste water is pumped into the biological reactor until a preset upper water level is reached. At this point aeration commences and continues for a period of approximately eighteen hours. During the aeration cycle, the biomass is completely mixed and biodegradable COD degradation and nitrification take place. At the end of the aeration cycle, a period is allowed for liquid/solid separation - biomass settlement. Thereafter the supernatant is discharged until a preset lower water level is reached. A small rest period allows for accumulation of waste water in the flow-balancing tank, where after the cycle repeats itself. Supernatant from the bioreactor is pumped to a landscaped fynbos reed bed for final polishing and water revitalization. The reed bed creates a food web where micro-organisms are able to convert organic material to biomass and energy. In this way the reed bed serves as a treatment buffer for surges in effluent volumes. In the reed bed, potential pathogens as indicated by E.Coli measurements are destroyed in the food web. Dilute liquid chlorine is however dosed after the reed bed to ensure complete disinfection. Water leaving the reed bed overflows through three flow forms to an irrigation dam for reuse.